GLOBAL red and white meat processing giant JBS has delivered record results for its 2018 financial year just completed. Reporting to the market this morning, Brazil-based JBS announced net revenue up 11.3 percent to $181 billion Real (worth about $65b in Australian dollars), the highest revenue ever recorded by the company. JBS operates more than 400 production units and sales offices in 15 countries across north and south America, the Asia-Pacific region and Europe. Gross profit for 2018 rose 10.8pc to R$26.3 billion (A$9.46b); adjusted pre-tax earnings were R$14.85b (A$5.34b), up 10.7pc on the previous year; and net income reached R$1.606 billion. Strong results were seen right across the board in the company’s global divisions, including USA beef (incorporating Australia and Canada), South American beef, US pork, US chicken, and value-added foods (Seara). Within the company’s USA Beef division (including Australia and Canada) net revenue of R$78.6 billion was posted in 2018, an increase of 13.7pc year-on-year. Pre-tax earnings reached R$6.3 billion, 53.6pc higher than 2017 – all record highs. JBS USA Beef net revenue was US$21.5 billion in 2018, a 0.8pc decrease on the previous year. Net revenue reduction was driven in part by the sale of the company’s Five Rivers lotfeeding operations in the US, in March last year. “In North America, notably in the US, the fundamentals of the beef industry continue to be solid and favorable to cattle producers and processors, as cattle supply continues to grow and processing capacity remains the same,” global chief executive Gilberto Tomazoni said. “The strong US economy, coupled with the low unemployment rate, are promoting beef consumption and growing demand, resulting in higher margins for the US beef industry,” he said. Exports within the division exceeded volumes reported in 2017, creating a new record volume sale for the countries involved. “JBS USA Beef leveraged its global sales offices to increase its market share in exports and elevate profitability with a better sales product mix to its main markets,” Mr Tomazoni said. JBS Australia also improved performance compared to the prior year as cattle supply increased and exports to China and other Asian countries grew, he said. Primo Foods, the company’s packaged food business in Australia and New Zealand, continued to lead the market, driving consumer behavior through innovation and promoting strong results consistent with the company’s expectations. A graph showing a breakdown of destinations for JBS’s exports (all proteins, not just beef) showed a significant rise in trade into Greater China (including Hong Kong), rising from 20.9pc of all exports in 2017 to 24.1pc last year. Japan remained consistent at 12.7c, while the US increased from 9pc to 9.6pc as an export destination. The Seara value-added business had a 1.1pc jump in net revenue to R$17.67b. 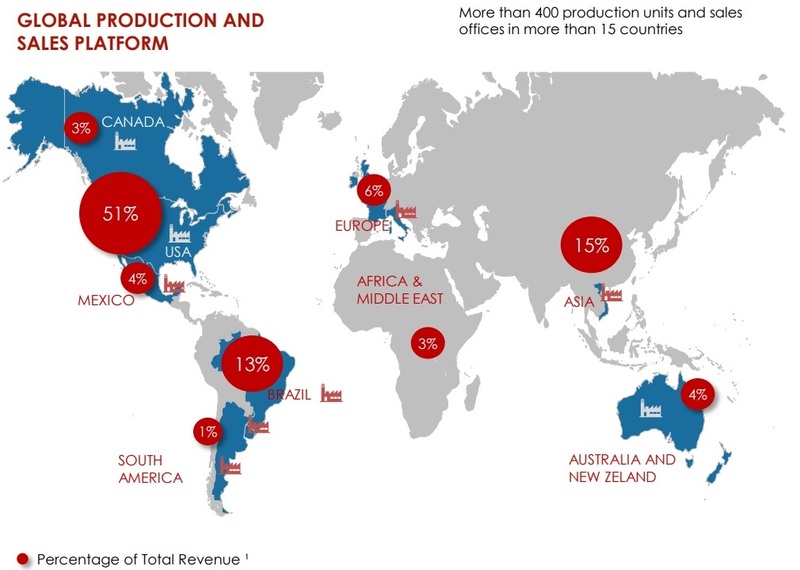 As this map graphic shows, 51pc of JBS’s global business (as a percentage of total revenue) is now conducted in the US, with Asia growing to 15pc, and Brazil, 13pc. Australia and Mexico each account for 4pc of total revenue, and Canada 3pc.